Mark Yates has made his second loan signing of the week with the arrival of 18yr old Reuben Reid from Plymouth Argyle on a one month loan. Like yesterdays signing, Paul Bignot, he will go straight into the side that entertain Grays Athletic on Saturday. "I think there is too bigger gap between our reserves and the first-team. I want this young fella to go there and it is part of his education to blend in with their squad for four weeks and tell me if they are saying anything different to me. It's about him, getting his confidence, getting some goals at the right level. I think he is a quick learner and he will get frustrated in our reserves, and frustration leads to bad play." 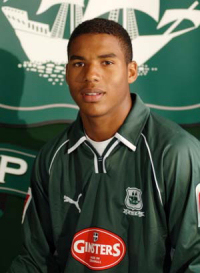 Before joining Argyle, Reid had trials with Manchester United and Crystal Palace as well as appearing for Gloucestershire's second XI in cricket. He'll be wearing the number 23 shirt on Saturday.